There comes a time in every medical student’s life when you feel like you are losing touch with reality. I’m sure this happens in other fields, but since I’m in medical school I can only speak to our proclivities (well mine at the very least). Anyway, after inappropriately binging the most recent season of Poldark, I was left with one nagging question: What the hell killed Dwight and Caroline’s daughter? How did he know based on looking at her? What on earth would kill a child when they got a cold? Seeing that I was on my pediatrics rotation, I felt that I should have enough skills to figure it out(ah, hubris). What are you looking at, Dwight?? Sarah is at least a few months old. The baby can support it’s own head and seems kind of large. Although, based on my vast amount of experience size of baby is not actually the best indicator of age (I saw more than 1 6 month old child that weighed at least as much as a normal size 1 year old). Sarah has some sort of observable defect that Dwight is able to pick up on, but Caroline doesn’t really notice as much? Given this information I had nothing. I turned to Dr. Google which provided me a the Biovault analysis which asked a slightly different question of whether Sarah Enys would survive her heart condition today. They speculate that she has hypoplastic left heart. I think it’s not a bad thought, but I feel like perhaps they are pushing their agenda a bit. 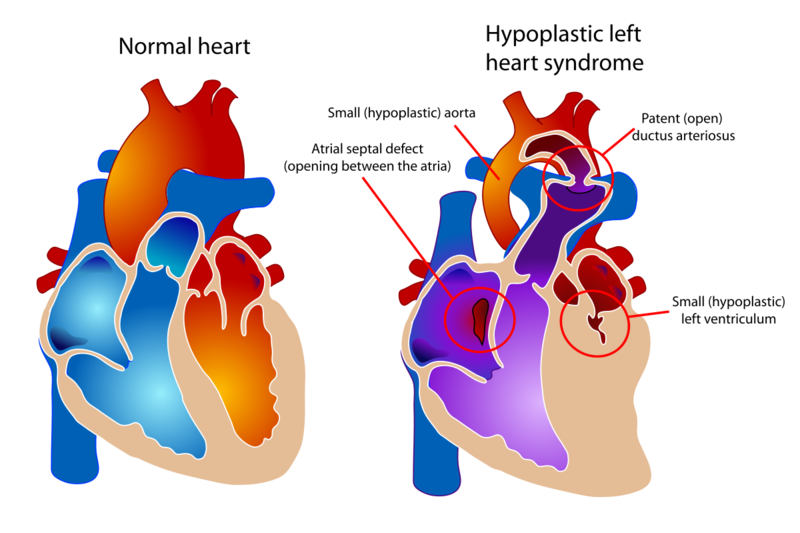 Hypoplastic left heart syndrome, the left side of your heart is underdeveloped resulting in decreased blood flow out to your body. This is generally thought of as Not Great. In fact, in places like the US where ultrasound screening is common and quite good, many of these baby’s will have intrauterine cardiac surgery which is (from a technology and scientific perspective) somewhat challenging and Very Cool. I wasn’t sold on their theory that hypoplastic left heart syndrome was presenting after a few months without any sort of sign that a doting mother wouldn’t pick up on (failure to thrive etc). Not to mention, you would need to have a lucky array of other heart defects in order to survive with hypoplastic left heart(see diagram above, you need to have a PDA and ASD). Not impossible, but feels a little too convenient. This is pretty much where my knowledge ended. Fortuitously, around the time of my ponderings I attended a lecture on congenital heart disease given by a Pediatric Cardiologist. After the lecture, I went to ask him about this theoretical patient. In retrospect, I’m not entirely sure what drove me to go up and ask a doctor with patients to see about a TV character’s death, but you know… when you are losing your sense of time and self, you also tend to lose your shame and fear. He was surprisingly helpful in narrowing down the differential. In the end, we decided it was likely Tetralogy of Fallot. (ToF). Many people with ToF survived into childhood or adulthood without intervention back in the day. In modern times, these patients typically have surgery in their first year of life. So, what did Dwight notice? Perhaps blueness around the Sarah’s lips when she was crying or feeding. These are known as Tet spells. Perhaps she was all around just a bit blue (happens because of poor oxygenation, note that the blood from both sides of the heart are mixing in the diagram above). Perhaps he noticed she had a particular weird heart murmur (though heart murmurs are common in babies and often benign). The best part of this was at the end Dr. Peds Cardiology was like “let me guess this show… Poldark?”. Let this be a lesson to never underestimate art/media as a way of bringing people together. **This post is not really meant to be an educational post of what Tetraology of fallot is and it’s pathology. There are plenty of wonderful websites, youtube videos, and textbooks that explain it better than I could in a blog post. Please check out these resources if you are curious. Previous Where Should You Go Next?